The Grove - Mixer Pack is stand-alone, Lego-like electronics kit. The Mixer pack is a plug and play, no Arduino required, kit for making electronics projects! The Mixer Pack consists of 13 mini modules, there are Power, Logic, Sensors and Actuators, It is a group of Grove compatible modules designed to quickly build functional prototypes. They are tiny, colorful modules that are accessible and fun for children. With this kit you can integrate circuits into your project without an Arduino or computer. By connecting different input and output module, they can be flexibly applied to a variety of control methods, such as the hand control, sound control, light control. 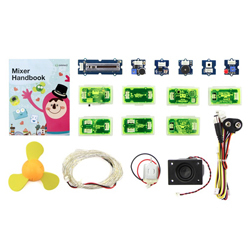 With this kit you can easily learn the electronics while having fun. For technical support, please post your questions to the Seeed Studio forum.